Chinese port operator China Merchants Port Holdings (CMPort) has announced the acquisition of an 85% stake in Hambantota Port at Sri Lanka for USD 974 mln. 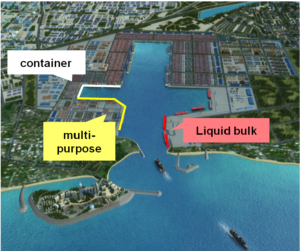 The Concession Agreement to develop, manage and operate the port has been reached between the company, the government of Sri Lanka, Sri Lanka Ports Authority (SLPA), Hambantota International Port Group (Private) Limited (HIPG) and Hambantota International Port Services Company (Private) Limited (HIPS). According to the agreement, CMPort will invest up to USD 1,120 mln in Hambantota Port and marine-related activities, of which USD 974 mln will be paid directly to SLPA to acquire 85% of HIPG shares, whereas HIPG will acquire 58% of HIPS port services company. HIPG will get the sole and exclusive right to develop, operate and manage the Hambantota Port and HIPS will be granted the same rights with regards to common user facilities for the port’s operation. The remaining USD 146 mln shall be deposited into a bank account in Sri Lanka while CMPort continues discussions with the Sri Lankan government on future port and shipping activities in Hambantota. If no agreement is reached within one year for the use of the funds, the company can withdraw any amount in the account. Apart from the 99-year concession term, CMPort has secured that during the first 15 years Sri Lankan government and ports authority will ensure no development of any port or terminal directly in competition with the services and businesses of Hambantota Port within 100 km perimeter. Hambantota is a deep-water port with a draft of 17m located on the southern coast of Sri Lanka. The 3-phase port development project involves the construction of a major industrial and service port with an attached industrial zone. Phase 1 of the Hambantota Port was completed in December 2011 and the operations commenced in June 2012. After Phase 2 construction works were completed in April 2015, the port has 10 berths, with a quay length of up to 3,487m and is able to handle container, bulk, general, Ro-Ro and liquid bulk cargoes from large ships. According to the company, Hambantota Port holds enormous potential for future expansion, with its hinterland covering South Asia and its strategic position along the “Silk Road Economic Belt and the 21st Century Maritime Silk Road”. “Having already established a story of success in Port of Colombo through the development of the Colombo International Container Terminals Ltd., the addition of the Hambantota Port will provide the Company a platform to materialise synergies between the two major ports in Sri Lanka, unlocking the county’s potential to be a global maritime center,” informs CMPort’s press service.